Love the new site. just joined but a longtime watcher. hashflare.io. 1 yr 140usd per 1TH thoughts both on ROI and on hashflare as a company? I'm going to start off with Cliff's disclaimer (as Cliff always starts off his videos) because this post is a lengthy one and involves some calculations: This is not financial advice and I am not a financial advisor. Don't invest what you cannot afford to lose! The content in this post is purely of my own opinion and is for entertainment purpose only. I have a hashflare account for just over a week now and I did some research on them before I signed up and they look legit and reputable. Since we are all in this together, I figure I will share with you my investment and returns so far. I invested $350 with them which gets me 2.5 TH/s on the SHA-256 contract to mine Bitcoin. I cannot comment on any other contract as I'm only interested in the SHA-256. I know this is by no means a big investment but it was my first cloud mining contract so I figured I'd start out small and see what the returns look like. They charge $0.0035 for every 10GH/s per day on SHA-256, for my 2.5 TH/s contract this equates to 0.875 USD per day. 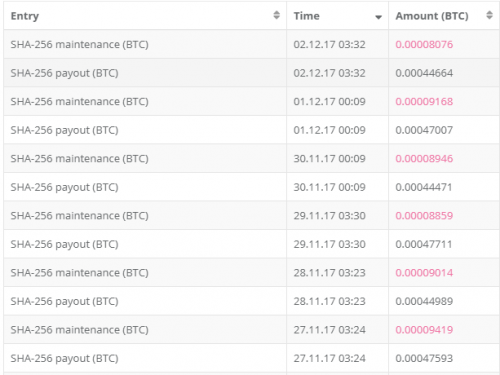 Due to BTC price fluctuation, some days the maintenance fee is less in BTC, some days its more. This variance is negligible due to different pool payouts, etc. The cloud mining service allows you to choose between 5 mining pools with a max of 3 different mining pools to split your hashrate between. Either 100% to one pool, 50/50 between 2 pools or 33/33/34 between 3 pools. I have not played around with this and have left it at the standard 3 pools as I have the most chance of stability this way - selecting other options may yield different profits, I dont know. Taken from the dashboard revenue gets me to 79.2% actual payout. Now when I invested my $350 it would have only gotten me 0,04228009 BTC if I had bought BTC on an exchange. 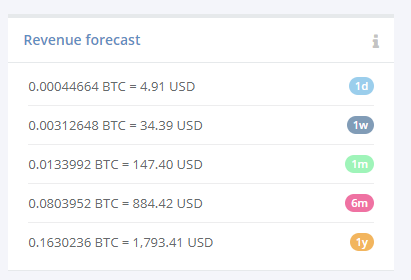 Looking at an entire year of actually getting paid out 79.2% of the revenue forecast leaves me with 0,12911469 BTC. Thats just over 3x return! A year is a long time and the mining difficulty will constantly change along with the BTC to USD price (which is linked to the maintenance fees) so this is a very early mathematical calculation based on forecasts - and forecasts also predict the price of Bitcoin going up which means maintenance costs related to BTC will come down. But based on these calculations, in my opinion, it's difficult for me to see myself making a loss and therefore I term it in a "lower risk" part of my high risk cryptocurrency investments in which I ultimately get out more Bitcoin than I put in - and this is my end goal. If you liked my post and found it informative and feel you want to give hashflare a try, I would appreciate it if you used my referral link posted in my bio - if not, no hard feelings, atleast we'll be cloud mining Bitcoin together! Can't comment on Hashflare but as far as ROI goes.. you can use whattomine.com for a very rough guess. Assuming the difficulty and price don't change (which they will) and not factoring any maintenance fees the following link should give a 'finger in the air' estimate. I just signed up for 300 like MrSereebs but haven't had any data to share since I've only been up on the site for 7 hours now. I figured I'd put 300 in to see if I actually get it back or get scammed. If this works I will probably do more. So looking into it and the small run that im doing. Seems it will take around 85-90 days for ROI as of today. Alot of hashing power has come down. So they obviously moving to BCH. So this ROI can change quickly when the difficulty goes up. Remember to subtract the 18% maintenance fee. Note that it is only a 1 year contract. Thank you all for your replies. I also have used for about 10 days and so far i have found following. 1- there is a 18% maint fee, but still profitable. "We would like to remind you that HashFlare is unable to speed up the transactions in the blockchain. Lower commission transactions may take multiple days to be confirmed, since they have a lower priority from the perspective of the miners. " i have two issue's with this A-- are we "via hashflare " not the miners that quote references? B-- why is genesis so fast and much lower withdrawal fee? BlakShadow Im going to do a review after a week or two! So far all looks good and damn profitable. Hope it stays this way till end Feb. Then its basically ROI. The new miners then are released which should cause a spike in difficulty.